This tape scores 5 out of 5 crabs! Having been a scrapbooker and cardmaker for a number of years, I am always looking for the most cost effective and best products. When it comes to double sided adhesive tape, I always used the orange rolls of tape. For anyone who is a scrapbooker – you know what I am talking about. It’s the tape with orange film that sticks to you when you remove it from the adhesive. 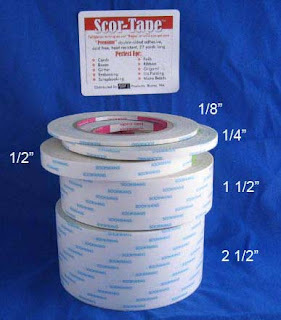 One day I found the scor-tape at a local store and have been hooked ever since. The tape comes in large economical rolls (27 yards! ), as well as 5 different sizes (1/8, ¼, ½, 1 ½, 2 ½)! This is acid free and even heat resistant. It can be used for embossing powders, beads, glitter, or ribbon (my primary use). I always have the 1/8, ¼, and ½ sizes on hand. This tape is easy to cut, (it’s paper backed no plastic backed) it does not ruin your scissors with sticky adhesive and is beyond easy to apply to your paper. I LOVE IT! I will not go back to the orange (red) tape and would strongly recommend it to everyone. We are pleased to introduce our most unique scrapbook to date. This book is shapped like a barn and silo and each page of the book corresponds to the song Old McDonald had a Farm - EIEIO!! It even contains an original piece of paper piecing art work in our Geese. This was a SVG file that we created to go along with the song! We hope you love this book as much as we do! There will be many more "shape" scrapbooks to be posted in the next couple of weeks. This is a detail slide show of our latest listing in our Etsy store. It's a 6x6 Baby Girl Scrapbook that we are selling for $25.00. Let us know what you think about it!